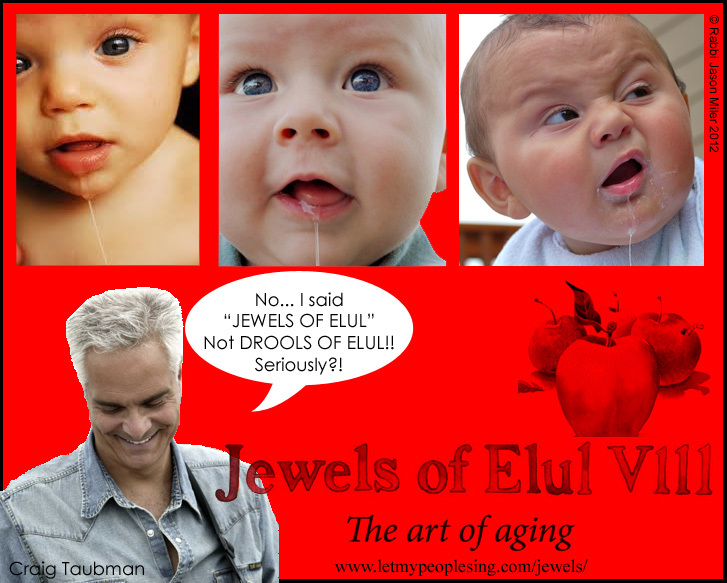 My friend Craig Taubman, a very talented musician in California, asked me to "make something funny" to promote his 8th annual "Jewels of Elul" project. For the past eight years Craig has been collecting short stories, anecdotes and introspections from fascinating people and publishing them on his Let My People Sing website during the Jewish month of Elul. As he writes, "There is a great Jewish tradition to dedicate the 29 days in the month of Elul to study and prepare for the coming high holy days. The time is supposed to challenge us to use each day as an opportunity for growth and discovery." Apparently, I misunderstood Craig when he asked me because I could have sworn he said "Drools of Elul." Kol Hakavod on this awesome project Craig! Shabbat Shalom!